Mr. Money Mustache and the Realist got into an epic battle last night, similar to the one where Good Superman and Bad Superman smashed each other around in the auto wrecking yard in Superman III. However, unlike Superman, we ended up in a death grip of mutual strangulation where our atoms both fused into one Ultimate Financial Being. So now you may find both sensitivity and brash belligerence displayed within the same posting. Also, Mr. Money Mustache may still refer to himself in the third person, just because he finds this makes him sound more authoritative. I’ve been getting quite a few comments already, both online and offline. This is to be expected with a controversial topic like money. A blog like this can be offensive to many people, because the subject of money gets mixed in with your feelings around happiness and life security. So to have somebody telling you how to handle your money, when they don’t even know you!? – Forget it! First of all, Mr. Money Mustache is not judging you. He loves you and he is here to help. And Another Issue: perhaps you feel alienated because you read Mr. Money Mustache’s Own Story and saw that he and a very cooperative wife started saving earlier than you did. Don’t worry! It’s not a contest of how early you started. It’s a contest of who can start making some changes in their life right now which bring them benefits in the surprisingly near future. Not every person is a good candidate for the MMM way of life. If you’re already supporting a large number of children (or have other unstoppable life-and-death expenses) on a very small income, you are probably more frugal than me already and may gain very little from reading on. But what I keep finding every time I meet new people, is that almost everyone has a pretty reasonable income – higher than what we currently live on – yet they all seem to be just barely keeping above the waves financially. Others have a super-high income (defined by me as over $100k per year for a household – $50k for each person in a couple), yet STILL tend to borrow money for things like cars or even carry a credit card balance. These people are my target audience! These are the people who have the power to start feeling like lottery winners on the gusher of income they are currently sitting on, instead of being a slave to their current inefficient spending patterns. It is commendable to advance yourself in a career to the point where you earn such a high income. But most people manage to build up a spending pattern that burns the money as quickly as it comes in. If you are one of these people, you’re in the right place. Because although I also earned a good income, the big difference between you and me is that I lived like an engineer both on and off the job. That is, being an incurable engineer, I can’t help but to calculate out every possible spending decision over a lifetime and weigh it against a dollar-value estimate of the potential hassle. So I make certain decisions differently and end up with the same desirable lifestyle – fairly big fancy house, good cars, a self-employed (and fully optional) ten hour workweek, lots of fun vacation travel per year, yet at drastically lower levels of cost and debt. I started this blog figuring that surely some of these tricks could be boiled down into a nice periodic column. And here we are. But the bottom line is if YOU, middle-income-person, make some of Mr. Money Mustache’s recommended changes in your spending, you will become rich quite quickly, and you will enjoy the process immensely. yo mmm- Long time listener, first time caller. as a successful young urban professional, I generally have more income than I can spend. I used to ‘stash every possible penny, but I noticed recently that i had slacked off and my balances are not much different than they were a year ago. I decided to use my expensive Internet phone to track every penny spent over the last two months- and I discovered some alarming trends when I graphed the data. I’d like to suggest this exercise to your readers as an eye opening introduction to understanding how money flows through your life. Hi Mr. Salisbury. Thanks for that fun suggestion. That sounds like a great position you are in, for potential early retirement when you choose to do so. Did you use any particular iPhone personal finance or spending app, or did you just type everything into the little yellow note pad thingy? As a note on tracking/budgeting, the hardline Mustachian opinion would be that instilling a deep aversion to ANY kind of spending is the simplest way, since then you always know your spending is at the optimium level. As opposed to traditional budgeting, which just gives money wasters permission to waste their money in controlled amounts. But perhaps a tracking tool like yours would be a good introductory class in the series that eventually leads to a Frugality Black Belt. As someone who has recently been in their own marital financial debate throw down, I was curious where you stood on the subject of building up a 6 month savings cushion versus flinging money at existing debt? I know what Dave Ramsay says, but I also value Mr. Money Mustache’s experienced opinion. Thanks! Another great question from my top commenter so far – thanks! I wrote up a reply for you, but in the end it all sounded so good I moved it over to become an actual post for today. The title is Springy Debt instead of a Cash Cushion. My experience is that work becomes a lot more fun when you don’t need the paycheck. Like you I’m an engineer and I love solving the puzzles that appear in our product development lab. But I hate sitting in long meetings, making powerpoints, and taking on boring busywork– so I don’t. I’m good enough at the parts I like (perhaps only just) that I get away with it, while my colleagues who took on the commitments of a high-maintenance lifestyle basically have to eat what management dishes out. The other thing you young people need to be aware of is that it’s no fun staring down a company reorg once you pass the age of 45 if you’re not financially ready. My company is in that state right now and morale among the rank and file isn’t very good because we know the big L is coming in a few weeks, we just don’t yet know how deep it’ll be. Jobs are recovering in this area, but it’s been pretty slow so those who are cut may be on their own for many months. In my case thanks to my life history of low expenses, I don’t need to trim at all. Schedule B covers it. That money I didn’t spend on Rolexes and Porsches ended up in shares of big oil & telcos so I’m getting a gift that keeps on giving. Sure beats hoping to cover rent by having a garage sale. My point is that even if you don’t want the life of leisurely vacations and conspicuous free time, and even if you really enjoy your job, get prepared financially for a rainy day by following your blogger’s advice. Even if you never need it, I think you won’t regret having it. Great point about the fact that financial security drastically improves life even for working people. I think sometimes I get so excited about the benefits of early retirement, that I forget to mention the other benefits that start much earlier on. And it is true that many people just love working – including me. I could never be happy just sweeping my driveway every day, so both my wife and I still do quite a bit of work. I think I need to expand the message a bit as we go on to avoid scaring off people who don’t actually want to quit their jobs. thanks again for your comments – keep ’em coming! I love the point about being ready even if you love what you are doing now. Two years ago, my husband’s employer was bought out by another company, and quickly instituted policies that made the job a lot less pleasant. About the same time, I got a new director, and the work environment changed drastically. I am no where near the 25% mark, but have made sure to put away a significant chunk for “later”. This allowed both of us to make plans to leave what had become negative work places. I do know that we are fortunate in that I have enough years experience in a public agency to “retire” even though I am not near 65, and “retire” with insurance coverage for both of us. Even with half-hearted frugal practices, and a lot of slipping, we are now embarking on our own and loving that we can do so. I can only imagine the possibilities if we had had true “mustaches” way back then. I am proud to say that one of my sons and his fiance are currently living with us while they save most of their income so that they can eventually put a very large down-payment on their own home. I am glad I found this blog, and I am going to send my son to read it!! He is young and just starting out (and with an accounting degree). Thanks for such a great resource. I also loved the idea that work becomes very different when you don’t need the money. As a former teacher, I “retired” early and got an CELTA certificate to teach English. This has allowed me to live in other countries for up to a year at a time, enjoy immersing myself in other cultures and travelling in those parts of the world, all on the income I make in that country working about 25 hours per week. Meanwhile, aside for some home maintenance and tax bills, my money accumulates back home. My wife and I had the beginnings of this sort of conversation last night. We have an income of approximately 105k combined and have been contributing around 10% each to our 401ks. Beyond that we save approximately 1000 to 1500 a month. I’m not sure we’re ready to go all the way and start saving 50% but I’d like to move up to saving 2000 a month. I think we can do it without too much stress. I should mention that we don’t have children, at least not yet. Thanks for the blog posting I’m landing here from the ERE page and Get Rich Slowly Blog. Nice to see an acknowledgement of your target audience. I’m not it but that’s not to say I won’t learn something. ;) It’s awesome to see such a similar approach to life within multiple tiers of income. I just started reading your blogs from the beginning. Where were you in 2003 when I needed you?!!! I was your target audience then, but now I’m just really really poor, and I fear I may always be this way. I sure hope you have a blog on what to do with a less than cooperative spouse, which is what I have and the sole reason of my poverty. I love him more than money, but I really would love SOME money. Recently started reading yer blog from the very beginning and I’m loving it. Finally, some practical financial advice w/out the usual greedy assumptions. I loved this post. I am really new here and too old to retire early (49 yrs. old). So, okay, early retirement won’t work for me but I can still optimize the spending that I do. I have already made a few changes which save me about $100.00/ per month. I am currently doing contract work and once my contract is over in 2 months, I will look for a new permanent job. My goal is to save 1/3 of my income when I am back working full-time. Previously I had been saving just over 10% or so of my income. PS: I did my first sale on Craigslist this week and sold a designer purse that had been gathering dust in my closet. I am going to buy a bike with my proceeds! OH hells yeah!! As soon as I opened this article and saw the Superman III reference I knew I loved it. 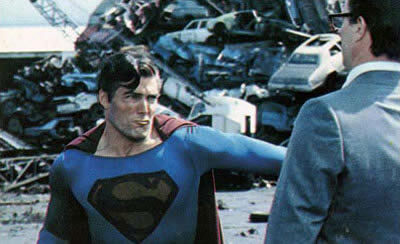 Superman III was the best one! In terms of the article, before coming across this blog I fit well into your key demographic and am making great changes. I’m keeping a tally of how much MMM has saved me, and thus much richer I will be in my lifetime from stumbling across this site! Jennifer that is a wonderful attitude to have. And I’m pretty sure that with an attitude like that, you can’t go very wrong with life. Wishing your family & you, satisfaction & success in your lives. I always thought I was in the “middle class” society, but after reading your blog, I guess I fall more in the lower class. My income is only $27K a year, with my husband making maybe the same or just a little less. However, we have very little saved for retirement and we are in our mid-50’s, which leaves us stressed and disheartened. However, I honestly don’t know how to save 50% of our income. It seems virtually impossible. We have 0 mortgage, 0 car payments (at present), 0 credit cards (learned that the hard way), and our monthly bills total usually less than $500.00 a month. But when I look at my paychecks every two weeks, without purchasing anything, I barely have $50.00 a week left over. I do have $50.00 a pay taken out for retirement, but aside from that, being diligent with saving has been really hard. I set up a budget for my paycheck and it looks like this: 10% for my tithing, one half of the monthly bills (hubs pays the other half), gas expenses, which is usually <$30 a week, $60 a month goes into a christmas club account, and every 6 weeks I have a $15.00 chiropractor appt due to migraines. I initially was trying to save about 25-30% of my pay, which really only amounted to about $200 a pay, but over time, it got used for necessities such as groceries or something for the house. I'm not trying to make excuses, but I pack my lunch every day, I make coffee & tea at home, I don't eat out during the week, except one day when I go to take care of my elderly mother (for time constraints), plus on the weekends we usually eat out one time. We owe no debts, but yet, it always seems that we need money for something. I rarely buy myself clothes, my car is 7 years old, I have a pre-pay cell phone, and aside from cable, we really don't have any other expenses. How do we get aggressive with saving when it seems we can't find any extra money? It is very frustrating, but I want to be frugal without depriving us of stuff we need ( not always want, just our basic needs). I am willing to scrimp, but there becomes a point where you actually just become cheap. Any suggestions? I have been enjoying your articles, but in all honestly, it sounds like your income was considerably higher than ours. I want to be realistic but still be able to save in the next 10 years so we can retire. Thanks for your website. This is a grand total of $17,515 of expenses. Since you make about $52,000, you should have roughly 66% or $34,485 left over after all your expenses. :) Hope this helps! Good luck on your journey!!! Super late posting.. but I totally agree with Marc, cut out the tithes. Your situation sounds similar to my own mother and I told her the same thing. God will understand, your church will survive. I don’t understand the $60 for Christmas Club. Read more MMM and you’ll start making the gifts instead of buying them. Then you can save the $60/month. Shop thrift stores now for Christmas gifts. Who says you have to give the latest new thingy? I am absolutely thrilled to have come across your blog (you were on a podcast I follow). I am excited to learn from your experiences. I finally got my husband on board to create a household budget with me, and to consider the importance of an emergency account and savings for future items. It took me 3 years to get to this point (it was a struggle. he fought tooth and nail against “restricting” any spending). And, we make 100k a year with nothing to show for it! Only a mountain of debt. I’m not saying he’s the only one that incurred debt- it takes two to tango. But I feel hopeful he will understand what I have come to understand. I know once he sees that it’s possible to afford a vacation (which we haven’t been able to “afford” yet) AND see our savings grow, by following some basic ideas presented here and other sources, his eyes will be opened and we can both dive in whole-heartedly in becoming financially independent together. I am super excited and will let you know in a year where we are (hint: it will be good. I just know it). Our two daughters have congenital heart defects that require lots of ongoing medical care (costs), even though I have great insurance through my job (that I enjoy) – we still spend a little under $10,000 in out of pocket costs in “bad” years. So until we nationalize healthcare in this country, I’ll be a wage slave (a rather contented one though:)). I just wanted to reach out and say thank you. You have a very powerful and potent approach to “frugality” that I’ve never encountered before. You manage to make frugality sound noble, fun, and obvious. I’ve had a spending problem all of my life. I’ve tried to get a grip on it many times. It’s basically anxiety alleviated by spending… but the hangover is finally hitting home, and I’m finally, apparently, ready to make some changes. I found your blog via a mention in the NY Times a few months ago and since then I have managed to max out my IRA, put $17,500 in a 401k, pay four or five extra mortgage payments, and have $20,000 in the bank. My whole attitude to life and money has changed. The concept–very true and obvious to me now–that my spending habits were adding to the planet’s woes was powerful medicine, and I feel so much better about our lifestyle. I am 47 years old, a single mom of two teens, and I still have a negative net worth. I owe $507,000 on my house in Oakland (that I borrowed against–the house was actually purchased 17 years ago for $211,000–I know, ouch). Last July, I took my two teens to Buenos Aires, where we are living now and where I am able to save money. I have rented my home in Oakland and halved our living expenses. I’m not sure how long we’ll be able to stay here (my kids’ patience is wearing thin), and I hope to continue a Mustachian lifestyle upon our return… whenever that is. I am so happy to not have a car any longer and have no desire for one. I just wanted to reach out with a resounding thank you. My son is all about you too, and is pestering me for an IRA, which I’m setting up just as soon as I can for him (he is 16 and an entrepreneur: see stoaked.co). We love you, MMM. Truly. Hi there. I’ve been reading this blog and i wanted to salute you for your work here. It’ really amazing. 1 – Here in Brazil i can put my money to work for something like 15%/year. And it’s safe investing (like us bonds). 2 – But i can wire transfer it to my US Vanguard account and buy something like VTSAX. What would you do? I intent to return to the US but as an early retiree. I find education here really expensive (somehting like 4k dollars/year) and i can’t stand being here anymore (LoL). I have no kids but planning on having then in 5 years. Like yourself, i’m a very frugal person but i want to raise my kids in america. What would you do? I don’t know how much is the life costs in Alexcandria/VA (where i have other relatives) and how much should i save to live there. Thanks for your help. When we first started our FIRE journey, we didn’t have a ridiculous income. We’re above average income for our city, but by no means were we living high on the hog. Even with a modest lifestyle we were in debt up to our eyeballs. The trick here is all about living within your own means. Almost anyone can employ the Mustachian method to getting out of debt and developing savings. Granted, it’s definitely easier for people who are rich or middle class, but it’s still doable and attainable for almost anyone. I think it’s about eliminating the excuses and understanding that the “extreme” isn’t extreme after all if you want to live freely. I’ve been reading your blog for a few months now. I wanted to say THANK YOU! for taking the time to write this blog! Even though (according to this post) my family is not your “target audience” (my husband and I have been married twenty years and we have seven children). Our oldest child is in college (paying his way through), our second works full time, and I home school our other children. We are frugal. We live in a darling 1955 home that is paid for. Our two cars are a passenger van, and a Scion (exactly like yours 2006 silver hatchback)~ paid for. No other debt except a small amount of medical debt as our 14yo son had to have two surgeries and a hospital stay of sixteen days recently. Ugh! Even with our “great insurance”, it costs a lot and the portion we have to pay is large, but we are doing it as quickly as possible. Anyway, I wanted to say hello, and thank you for your encouragement and inspiring posts!!!! I’ve started reading from the beginning as a result of your podcast with Tim Ferris. We are kindred spirits, you and I! Right now my husband has a year left of his bachelor’s degree, I’m expecting our 5th child and we’re in our mid-thirties. When I was pregnant with our twins 6 years ago, we bought a great 2005 Odyssey with our savings and it has been amazing and perfect for our growing family. We have cut every possible expense (except Netflix. We have no cable, but Netflix is a life saver some days!) and have been living off our equity, student loans and (I’m in Calgary) government child benefits that come monthly. Before I listened to your podcast, I had the thought “Gosh, when my husband graduates and gets a job, we’re going to be rich! !” Because really, our expenses have no need to change. (Except child school fees, of course) There will be student loans to repay and the equity to pay back, but by putting all the extras toward those, I really don’t see it taking long at all. I’m not in your target demographic now, but I will be soon and I appreciate the support of other frugal mindedness to keep me on the straight and narrow. (A friend of mine said “but when you make more, you spend more.” WHY???) any how, I thank you for sharing your wisdom and experience.